Open Europe: So Bankia is still a viable bank...? Spain announced its plans for cleaning up its banking sector earlier. With the full legislation only just released, we are still looking through it and will bring you the pertinent points in due course. But there was also another interesting development with regards to the ailing lender BFA-Bankia. The Spanish government announced this afternoon that BFA-Bankia will receive an "immediate capital injection" from Spain's bank restructuring fund (FROB). Nonetheless, Spain has decided not to request the early disbursement of part of its €100bn bank bailout package. This is despite the fact that €30bn had been set aside for emergencies, as the Eurogroup noted in a statement issued earlier this afternoon. The funds will therefore be paid out in advance by the FROB and will be eventually incorporated into the Spanish bank bailout when it is fully dispersed. This raises a couple of interesting questions. Firstly, why is Spain so keen to avoid tapping the €30bn kept in reserve? The money is there for just such an occasion, and in fact it was fairly obvious that this exact situation would arise. What's more, the money will be folded into the bailout anyway. Therefore, we can only imagine that the Spanish government is keen to avoid some kind of negative stigma – although this seems slightly strange since the bailout is already confirmed. It is worth keeping in mind the constraints of the EFSF vs. ESM funding (which we covered here), so it is possible that Spain and the eurozone have decided they want to wait until the ESM is fully operational before tapping the funds. • In the past six months the banking group has lost a staggering €37.6bn in client funds, a massive 28% fall. 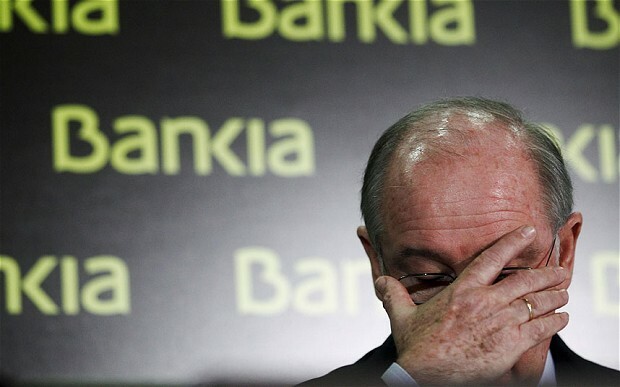 It’s been clear to most for some time that Bankia is no longer viable. The latest government plans for dealing with the banking sector provide for an “orderly resolution” of unviable banks and a template for splitting up its assets and winding down the institution. It is not entirely clear why this is not being applied here, although protecting retail investors could be part of it. In the end, though, investing further public funds into a failing institution will do everyone more harm than good. Basically another example that Europe's politicians have no clue what they are doing and which game they are playing. This crisis is supposed to be because of systematic risks (and imho that is correct). But can anybody explain what is systemic on Bankia or Cyprus? No one can. What is happening that some incompetents create a fund (with taxpayer money) and subsequently that fund becomes (like the EU and Euro itself) a purpose of its own (in its own right). Not we have a systemic risk; so see how to solve it; unfortunately we need funds from the rescuefund for that. We have a rescuefund; so we should use it. Anywhere a bank introuble, a country, greengrocer or butcher on the corner if necessary? Bankia is considered not systemic (and as you say is simply not viable). Furthermore Europe's banking sector (and especially Spain's simply needs a good thorough clean up. So it should be winded down. Structured if possible. All these rescues become this way much too expensive. The same with the silly ECB intervention now in the headlines. And a blind monkey can see that somewhere you will be running out of funds (totally absurd to think that people accept zero growth for a decade to pay for overspending and unsustainable systems in the South). So after a few Tn. will be spent the whole house of cards will fall apart anyway. While it could be saved with less than half of that, not that there is much worth to be saved. It is simply a system that doesnot work and that will not work as there is no consensus to give it a workable set up. Makes Don Q look like a rocketscientist. Here is a very simple test of whether Bankia is a viable bank: Would you put your own money in there?? I personally would not. Or another one: would you hire their boardmembers, CEO etc to run your bank? Or would you write in on a new issue? Would you tell your investment advissor if he was long Bankia and it would end badly: 'Just bad luck, everybody has that from time to time', or 'Your the biggest idiot in the universe, are roads split here and now'? Basically all summarised: Do you trust these people with your money? The general consensus on that is not even NO WAY. It is simply why has this guy to ask the obvious. And we are not even talking about systemic or not yet. Basically, longer term, this gives completely the wrong signal about the commitment and competence of the political leadership dealing with this crisis. It simply signals: we havenot got a clue; are scared like hell to make difficult decisions and do not want to confront our voters with inconvenient truths. A real longer term confidence booster. Not only would I not invest in Bankia as a business, if the Eu was a business I would not invest in it either. And that is exactly what is happening at the moment. First of all it is seen as a zero growth area for the coming years. Aka a lousy enviroment to invest in only because of that. Second the advantages of the Common market and one currency are largely no longer there. You think to invest in the Euro-currency area and you wake up and the country you invested in, is out or the EZ has broken up. And it can happen with all countries as it looks now. Financial investors can get out easily, real investors get stuck. Mainly by the UK btw. The UK should imho clear up its relation with the EU and asap. It is clearly heavily stressed by basically the UK public opinion. And it is not going away by letting it rest for a while. I know of 2 companies that have scrapped the UK of their shortlist. Initially they saw it as an alternative for the EZ, but they simply want to be sure that it is in the EU (Common Market or have a similar position) before they put their money there. Anyway investors want to know where they stand. Real investors even considerably more than financial ones. EZ will go or will stop. Who is in, who is out? Strong currency policy or weak currency? Rescue the bust-belt or not? Not properly answering these questions makes investments especially real ones highly volatile (and as a consequence thereof these are often deferred or cancelled). And as said earlier on top of a zero growth economy, that makes it even worse. No political or ECB drivel or wishful thinking, simply completely credible answers on these kind of questions. I am beginning to understand how Madoff - despite the clue of his name - got away with so much for so long. What it comes down to is people believing what they want to believe, what is convenient and pain-free to believe, rather than the truth. One particularly interesting sequence in a documentary about the Madoff scam (which incidentally had many other features, such as totally consistent high returns month after month regardless of the state of the economy, that should have warned off investors much sooner) was when his head honcho talked about making his own millions in the scheme. The interviewer said that he must have worked very hard to achieve it, but he shook his head and denied it, saying his friends always said that but it was "easy, easy", hardly any effort. When the interviewer then asked whether he wondered why he in particular was able to make so much so easily he replied that, yes, he and his wife used to discuss that until one night it came to them "God meant us to have it"
That, ladies and gentlemen, is the level of understanding of those involved in the euro scam, and always has been. Its not about economics or logic or trade or profit or loss or prosperity or starvation, instead it is a religion - they believe in it, many of them probably believe they are doing God's work and that therefore the euro cannot, will not, must not fail - and they will continue to chant their lunatic mantras and meaningless plans and objectives right up to the moment the roof falls in. So why waste so much timme trying to analyse, trying to understand, what in reality has no meaning, has no significance? Like trying to understadn Tracy Emmin's unmade bed, but far worse. I do not understand the question. Bankia has never been a viable bank. It is a collection of failed banks. It requires the government to support it. The government has to borrow to do so. The government has to apy an unsustainable 7% interest to borrow. It is only increasing its deficit and the unsustainability of its own debt. Only in Euroland could this be dreamed of as being viable. Rik has not an ounce of humble opinion, imho. Caught with my pants down, but it sounds really nice. I think originally it had a meaning (because it avoided wars, could be the basis for greater prosperity by free trade), but somewhere in the process after a while it became itself the meaning (the replacement gospel for probably mainly atheists, likely the ones that still effectively needed some sort of religion, something to believe in). EUism, and Barosso is its prophet. Could have done some nice things with the double ss, for instance giving it a nice German dimension, but unfortunately the computer doesnot allow it. My comment related primarily to EU economcis and the euro, not the EU itself - though there is of course a degree of overlap. It is now a matter of record, as I think I have pointed out here before, that the leaders of the euro project (a) new perfectly well that it would lead to a major crisis and (b) went ahead anyway, so that they could use that crisis to demand "more Europe" which is of course what they are doing. As regards the EU project, doubtelss different people had different objectives but in my view it is undeniable that the primary objective of most of the then top people was to bring about a single European State, for various reasons including ego, self-aggrandisment, hatred of America and, at least in some cases of muddle-brained incompetenets the belief that bureaucrats in ivory towers telling 500m people what to do and how to do it 24/7 could bring about economic success, prosperity and happy satisfied people. That the otheer Soviet - the USSR not the EUSSR - had tried it and failed did not seem to worry them. And of course it cannot work, because of the "wisdom of crowds" the reality that the collective,average views of millions will always be better than the views of a few privileged apparatchicks educated and promoted beyond their intelligance and massively overpaid beyond their deserts. As for peace, and all the rest of the pious nonsense, it was just propaganda for the stupid to latch onto, the feelgood factor that helped convert it in many minds from politics to, as you say, religion and therefore beyond criticism. Instead it is beyond reason.